Revocable Living Trusts are Easier to Draft Than Ever with ElderDocx. Check Out This Document Package Preview to See for Yourself. ElderCounsel’s drafting system, ElderDocx®, puts a smart, efficient document creation and assembly process right at your fingertips. ElderDocx helps you generate a wide array of elder law, general estate planning, special needs planning and Veterans pension planning documents. 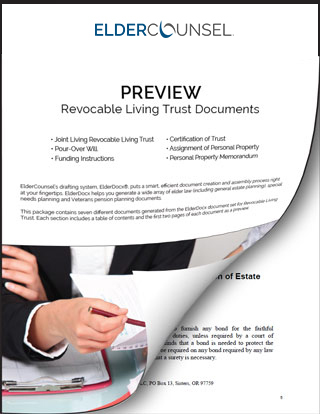 This package contains six different documents generated from the ElderDocx document set for Revocable Living Trust and supporting documents. Each section includes a table of contents and the first two pages of each document as a preview. Enter your information below to receive this preview today.